There is a new paradigm emerging in business and society as the industrial age comes to an end. This is a time of uncertainty, confusion and calamity. Understandably, the idea of transformation will be received by some with coolness, even hostility. Vested interests are of course opposing this change. Leaders of the old paradigm are having the greatest difficulty embracing the new. And understandably there is a crisis of leadership emerging. To succeed, we need a new kind of leader in industry – one who sees improving shareholder value as complementary to improving the state of the world and who understands that businesses must operate with a new set of principles. We leaders in government, who are focused on real change rather than personal power and who see citizens as active participants in the democracy rather than passive spectators. We need civil society leaders who break from the old tradition of bureaucratic NGO’s working in a traditional elitist model. We need leaders everywhere who understand that this is a time of transformation and taking us beyond old debates: Should we tweak regulation for financial services or not? Should we fiddle with the healthcare system or not? How can we monetize newspapers? How do we stop young people from “stealing” music? What should be done to make the United Nations of G20 more effective? How can we reduce government costs? This book has attempted to show that while all of these may be valid questions they are insufficient to solve what ails us. Our problems are not fixable by fine-tuning old organizations and structures. And that rather than predicting some future state, the heaving transformational collaborations and communities of today show us a relatively clear road ahead. Most important, it is becoming clear that many leaders of today’s old, stalling institutions are not equipped for this challenge and that leadership will come from new sources. Additive to business, government and civil society organizations, today each of us — as that “Fourth Pillar of society” — can and should claim the mantle. 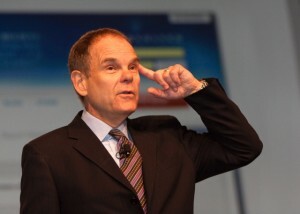 Don Tapscott explains the challenges of leadership, the new model of the collaborative leader and uses breath-taking footage of “The Mumuration” to discuss the idea of networked Intelligence and leadership for a new age. He argues, inspiringly, that process of transformation is proving to be challenging, exhilarating and sometimes agonizing. But given the stakes there is not really any alternative than to go forward and forge a new future. With the opportunity for each of us to participate, this is surely an amazing time to be alive.